Berkery Noyes Represents The Mandell School in its Sale to Rocket Group - Berkery, Noyes & Co., LLC. 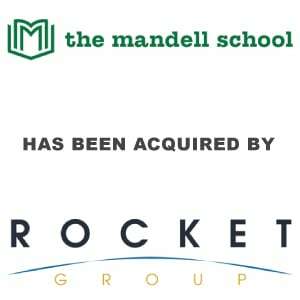 New York, December 16, 2013 – Berkery Noyes, a leading independent investment bank providing mergers & acquisitions and capital raising advisory services to the information and education markets, announced today that it represented The Mandell School in its sale to Rocket Group. Terms of the transaction were not disclosed. The Mandell School, founded by Max Mandell in 1939 in New York City, provides an engaging and highly-preparatory integrated curriculum to toddlers through 8th grade students in four state-of-the-art learning facilities. Starting as a single pre-school location in the Upper West Side neighborhood of New York City, Mandell expanded into the elementary and preparatory grade levels in 2008 as well as opened two additional pre-school locations in 2012 and 2013. Mandell fulfills a unique need in the early childhood/childcare marketplace for a high-end pre-school environment that provides both childcare and meaningful preparatory education. The schools’ integrated curriculum has been successful since its inception and continues to prepare students for global success, which includes placing children and students in top-tier, highly competitive K-8th grade and secondary high schools. Currently, Mandell enrolls 536 students across its New York City school network, including 296 children in its pre-schools and 240 students in its K-8 school. Berkery Noyes initiated the transaction on behalf of The Mandell School, acted as its exclusive financial advisor, and represented it in its negotiations with Rocket Group. Berkery Noyes provides strategic mergers and acquisitions advisory services to middle-market companies in the United States and internationally. The firm has been involved in many notable transactions in the information and education sectors, including Forbes Media alliance with Bridgepoint Education; Weld North’s acquisition of JBHM Education Group; Cambium Learning Group’s acquisition of Class.com; McGraw-Hill Education’s acquisition of Bookette Software; and Rockbridge Growth Equity’s acquisition of NorthCentral University. Debt and equity financing is offered through Berkery Noyes Securities, LLC. For more information, visit: www.berkerynoyes.com.